The young owner-chef Olivier Bianchi took over at L’Acteur in 2011 from Fabien Delhorme, who had been in charge since 1991. Since then he has ceaselessly defended his territory with both typical food and local wines from the Beaujolais region. Les Bouchons Lyonnais : Can you tell us the names of your chefs and the career paths they followed? 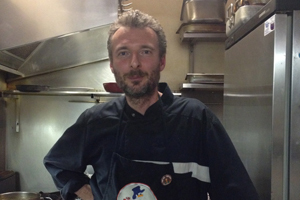 Olivier Bianchi, the young owner-chef, came to Lyon about ten years ago. Working in various Lyon restaurants such as Brasserie George, Le Comptoir d’Alice and the venerable Café Bellecour, over the years he became infected with the ‘traditional Lyon cuisine’ virus. LBL : Why did you decide to open a bouchon-style restaurant (generation, family, etc.)? OB : To fly the flag for the kind of generous, friendly, genuine cooking that I love to serve. LBL : Does your bouchon have any specialities or particular culinary style? LBL : What dish would you choose to symbolise bouchon cuisine? OB : It’s hard to choose just one dish to represent a cuisine that is as rich as Lyon’s. It ranges from frogs’ legs Dombes style to Saint Marcellin du Vercors cheese, Bresse poultry and Le Pilat apple tart. Lyon is right in the middle of a huge area of food production and has taken advantage of its position to enrich its gastronomic heritage. LBL : How would you describe Lyon’s gastronomic cuisine? LBL : Apart from the actual cooking, what else is different about genuine Lyon bouchons as opposed to other restaurants? LBL : What would you say are the qualities of a good restaurant owner? OB : Real cooking …. a typical Lyon dessert? : gâteau Lyonnais – it’s a cake that’s full of Chasselay pears and praline, an absolute treat.